On Monday, an 11-person delegation from Mzuzu University (Mzuni) will be visiting Virginia Tech for a week. The purpose of their visit is to engage with students and faculty in relation to the design of a new library for Mzuni. In 2015, Mzuni lost their library, containing over 45,000 titles, to a fire caused by an electrical fault. Since then, the Mzuni Library Initiative – an effort led by Virginia Tech and supported by Radford University, local community groups, and the Malawian Education and Children’s Welfare Foundation – has shipped over 8,000 books to Mzuni for their temporary library (see the video below). 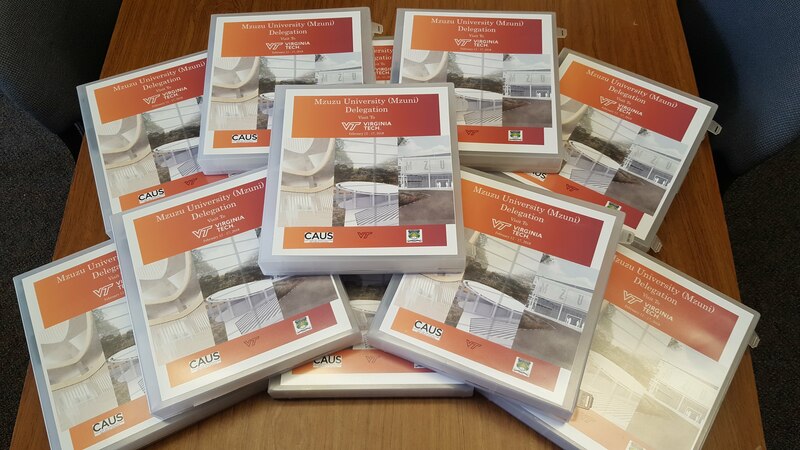 During the past year, four faculty and around 20 students in the School of Architecture + Design have developed three conceptual designs for a new Mzuni library (see the images on the front of the binders below). During their visit, the Mzuni delegation will explore each of these designs and connect with faculty across Virginia Tech who are supporting an effort to design a data analytics and visualization research+learning facility that could be located in the new library. The students will be publicly presenting their library designs on Wednesday, February 14, from 1-3pm in the foyer to Cowgill Hall. Please consider attending this event of you would like to learn more about this project. Reblogged this on The Mzuni Library Initiative.